Alpha Beta Gamma is an international business honor society established in 1970 to recognize and encourage scholarship among two-year college students in business curricula. Students must have completed at least 15 credit hours with demonstrated academic excellence by attaining a 3.0 GPA or its equivalent in business courses as well as a 3.0 overall average. The GHC Honors Club supports the mission of the GHC Honor’s Program by providing opportunities for extracurricular involvement. The purpose of the organization is to further the aims of the GHC Honors Program by providing social, extracurricular, and educational opportunities for students already accepted to the GHC Honors Program. Phi Theta Kappa is the international honor society for two-year colleges. 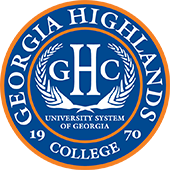 Students who achieve a 3.50 cumulative GPA with at least 12 credit hours at Georgia Highlands College are invited to join. Members must then maintain a 3.25 GPA. The GHC chapter is Alpha Psi Omicron and was chartered in January 1994. The organization elects officers, holds regular meetings and plans activities and service projects for members and the campus. Phi Theta Kappa also offers scholarship opportunities for members. Psi Beta is a national honor society for students enrolled in two-year colleges and interested in psychology. Some of the requirements for membership include an overall B average, at least a B average in the completion of two psychology courses and an interest in psychology. A one-time fee is paid for lifetime membership. The chapter meets and elects officers. Membership provides opportunities to develop one’s interest in psychology and to gain invaluable experience to include on a resume.